Its now nearly 10 years since I started campaigning for 20mph limits, first in Warrington and then throughout the UK. 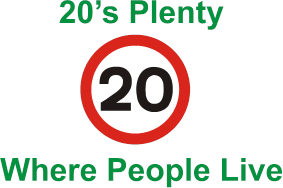 It is 5 ½ years since I set up 20s Plenty for Us in order to assist campaigners like yourself in influencing your local authority in implementing wide-area 20mph limits. And because of your efforts both individually and collectively we have made a huge change in the way that our roads are shared and in the debate on how they should be shared for the future. With now 191 local campaigns around the country we are probably one of the largest and fastest growing grass-roots organisations. And the fact that all of this has been achieved with what are mainly volunteer resources is a testament to both the popularity of our message and the work done by you all. Lobby local and central government on the need and benefits of lower speed limits. In my time campaigning I have had quite a lot of communication with campaigners and organisations around the world. Their perspective is that in the UK we are taking a progressive and pragmatic approach to lower speeds that is, through debate and the democratic process, sensitising whole communities towards treating our streets as public spaces rather than just roads for automobiles. And whilst in some EU countries they have an even more progressive approach to lower speeds and many decades of implementation we are really showing in the UK that cultures can change and make a difference. And that EU involvement is so important. It is a fact that the UK government is very much being influenced by our arguments and those made by local authorities to enable wide-area 20mph limits to be put in place economically and effectively. It is being recognised that we are in a transitional phase from the urban speed limit being 30mph everywhere towards a situation where 20mph is the norm. When so many of our iconic cities have less than 15% of their roads with a 30mph limits then 30mph no longer becomes a national default but merely a dated relic from the 1930s. And so it is time that we should be also looking to maximise our influence at government and pan-European level. We are already involved with the European Citizens Initiative to get the EU commission to seriously consider setting 30km/h or 20mph as the standard for urban streets with the ability for local authorities to make alternative arrangements for vulnerable road users. Indeed, I am one of the 7 members of the citizens Committee which has set up the initiative. And we have until November to raise 55,000 signatures in the UK. I know that many of you have already been working on this and have either influenced people to sign the initiative or sent me paper copies of signatures you have obtained personally. But we need to raise our sights and lift our game if we are to take maximum advantage of the opportunity which we have at our hands. Over the course of 29th April till 12th May there will be a major push by vulnerable road user organisations throughout Europe to raise awareness of the Initiative and increase the support and signings. This will be timed to co-incide with Global Road Safety Week under the patronage of United Nations and supported by the World Health Organisation. I would therefore ask each and all for you to join with fellow campaigners across Europe in making a real effort to increase participation and signatories for the initiative. I would like you to take copies of the initiative and ask your friends, colleagues and family to either sign the paper copy or the on-line page. In many ways the former is so much better because you can see it signed rather than relying on someone remembering to sign it on-line. A copy is attached and you can print off as many as you wish. If you would like us to send you some printed blanks then just let us know. Once you have got as many signatures as you can then please just mail them to me. Of course you can also take the opportunity to include a call to action for your colleagues and other campaigners to do the same with their friends, family and colleagues. We know that 20 is Coming. In some places its coming earlier and faster than others. But this really does give us all an opportunity to end the postcode lottery on speed limits and create an EU wide debate about how we share our streets as public spaces for all rather than just roads for automobiles. I am sure that if we can all focus our energies on this initiative during the two weeks of Global road safety then we can really leverage all the excellent work which you have done to-date. I therefore look forward to a strong response from you all in supporting the European Citizens Initiative for 30km/h or 20mph limits. Please get back to us if you have any questions. I also look forward to the signatory count increasing and receiving signatory forms from you all. This entry was posted in Uncategorized on April 15, 2013 by Bridgend's Green Leftie.